It’s been too long, coffee lovers! It’s been a crazy summer, I’ve been doing some weird excursions like graduating from college and getting a job…insanity. But the best adventures have been the ones involving – you guessed it – coffee. The biggest and best adventure of the summer was, without a doubt, my trip to Italy. 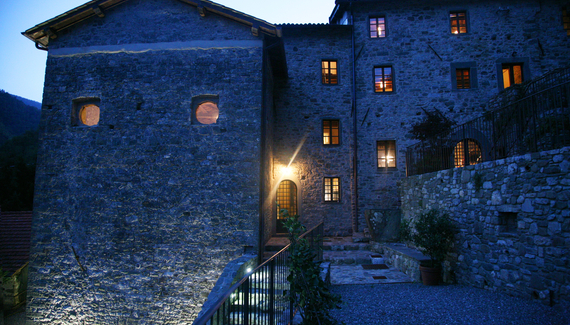 My fiance and I went to stay with my uncle in the ancient monastery that he’s remodeled into a bed and breakfast in the mountains of Tuscany. I know, right? You can’t write this stuff. This is the unbelievably beautiful monastery we stayed in for FREE while celebrating my great-aunt’s 75th birthday. There was so much wine and so many amazing stories, plus a crazy old French woman who smokes illegal substances with grill lighters, but those are stories for another blog. What REALLY blew my mind, and I’m sure you can all believe it, were the Italian cappuccinos. Obviously, cappuccinos were invented in Italy and are defined as “an Italian coffee drink”. So, naturally, their cappuccino game was on point. Cappuccinos in Italy are like their own food group, their own meal, their own snack. The cappuccino is respected and adored. As it should be. This is me (hi!) sitting on my uncle’s patio (I guess that’s the American version of what this was) and drinking my morning cappuccino, made by his own personal cappuccino maker. There was no coffee makers in Italian homes and hotels. No Mr. Coffee. No Keurig. Cappuccino makers only, sorry. For anyone who may not know, cappuccinos are prepared with espresso, hot milk, and steamed milk foam. The name derives from the Capuchin friars who originally drank cappuccinos in the 17th century, referring to the brown color of their habits that mimic the coffee’s color. Well, if the fact that you drink at least 4 or 5 of them a day doesn’t do it, the fact that cappuccinos are practically PURE espresso will reassure you that yes, it will be enough. The hot milk (and when Italian’s mean hot, they MEAN hot – caution drinking right away!) and steamed milk foam give a creaminess to the drink that helps to offset the extremely harsh, strong taste of the espresso. While sugar in American coffee is often frowned upon (flavored creamers, ya’ll), sugar packets are ALWAYS given with espressos; those little guys have some serious punch to them and sugar is needed. At least for a wimp like me. 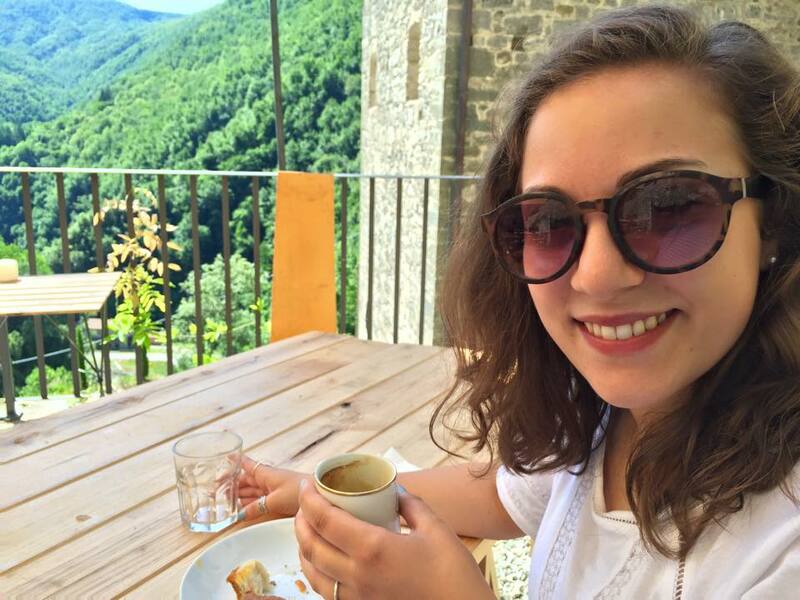 But my favorite thing about the cappuccinos in Italy were how ingrained they are into Italian culture. There were coffee shops on every corner of even the smallest town my fiance and I visited, and it was perfectly acceptable to stop and just take a cappuccino break. It so perfectly reflects the relaxed European attitude; sitting at a table in the middle of the work day just to drink a cappuccino, smoke a cigarette and look around nonchalantly. In fact, when Dan (my fiance) and I arrived in Venice for our first day, we were determined not to look touristy…but we were incredibly lost and overwhelmed. What did we do? Casually went into a coffee shop, ordered two cappuccinos, relaxed and made a game plan so when we emerged we 100% knew what we were doing. It worked. We were mistaken for Venetians more than once. Coffee saves the day! Honestly, we passed as Italians because one of the only phrases we knew was the one we used the most frequently: “due cappuccini, per favore”, or “two cappuccinos, please”. We knew this little phrase by heart and it immediately broke down language barriers for us left and right. Coffee is truly like a universal language, and Italians speak it fluently. I really enjoy efficiency. For instance, why not instead of having french toast for breakfast and coffee with it, just combine them? Be hopeful! What I have just described is a real thing. That’s right! French toast coffee. For this week’s brew review I tried some of this glorious sounding breakfast-food-flavored coffee. I gave Green Mountain Coffee’s blend of “GoldenFrench Toast” a try, and was pleasantly surprise! I was expecting a coffee flavor similar to the “Dirty Chai” that I tasted a few weeks back; cinnamon-y, spicy, but maybe a bit too watery. However, this was not the case. The French Toast coffee had the bite of cinnamon, but was much sweeter than the Dirty Chai and had a much fuller flavor. I was really pleased by the nice balance of sweetness and bitterness in the coffee; the bitterness was nicely accented in the cinnamon, but the cinnamon also brought out the sweetness as well, and the beans themselves had a nice balance between bitterness and a really smooth roasted taste. If I had to come up a critique for the coffee, it would probably be that (although the balance was a lot nicer than the Dirty Chai) it did lean a bit more to the bitter side. The brewed the coffee with a drip, which I think brought out maybe too much of the bitterness. If I maybe tried a pour over instead, I think I would have been able to more comfortably drink black than I did drinking it as a drip brew. But even that is a stretch at a shot of criticism! This was a mellow brew with a nice combination of flavors and a very full taste. AND I got a two-for-one for breakfast. I abandoned my go-to French Vanilla roast for this experiment. I didn’t want anything to get in the way of the potentially delicious or potentially vile taste. So I went for some plain Eight O’Clock coffee, medium roast, and brewed myself a cup. 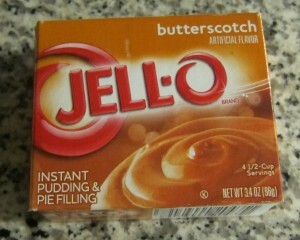 My roommate just happened to have this unopened box of butterscotch Jell-O lying around. Seriously? What does she need that for? So I took it upon myself to use it for her. According to the Putting Weird Stuff in Coffee, after putting in the dry packet of Jell-O into the coffee, it needs to be stirred with a cinnamon stick. Again, my roommate’s freakin’ weird and she has a jar of cinnamon sticks around. So, again, I took one off her hands to stir my coffee creation. The end result was a thick, creamy, and sweet concoction that tasted like I had just swallowed a smooth butterscotch chew with a bit of bite from the cinnamon. The taste definitely reminded me of a less-bitter cappuccino, with the same cinnamon kick neutralized by the sweetness of the butterscotch. Absolutely delicious. Two big thumbs up. Then, of course, I went and made my big mistake. I thought, “Hey, cinnamon, this is a good idea!” and dumped some ground cinnamon into the coffee. The addition of the cinnamon really soured the drink for me; it made it far too spicy to the point where it took away from the creamy sweetness of the butterscotch, which is the whole point of the coffee! So, if you’re going to try this at home, don’t be like me, learn from my mistakes and just use the stick to give that little spice to the butterscotch so that the flavors are more balanced. Unless you’re some kind of cinnamon fanatic, in which case, go crazy. I am getting all nostalgic today. Nothing like a good flashback to get you blogging. Today I want to revisit the moment I fell in love with coffee. I’m doing this because, after having been blogging about this for many weeks now, trying new kinds of coffee, learning a ton about coffee, and viewing coffee from a variety of new different angles, I want to remind myself how and why I started this blog. The day I fell in love with coffee was the day I brewed my first cup of coffee. It was my freshman year of college (late bloomer, I know, I was a spoiler Keurig brat) and it was in a Mr. Coffee (I know, I know, there was no grinder, no dripper, no fancy coffee brewer — just a plain, old Mr. Coffee. Give me a break, it was my first time). I remember I tried to make my first batch and completely ruined it by forgetting to put in the filter. Yep. Embarrassing. It smelled, literally, like burnt eggs and crushed dreams. So my mom had a little intervention with me. She told me that this was how to make coffee, how to really make coffee, and I needed to learn. We had a little work shop and then she pushed me from the nest and I tried again to brew my own pot. I remember it all very vividly. I can still remember the hissing, bubbling noise of the water boiling in the machine. I can still see the perfectly dark brown stream of caffeinated gold dripping steadily into the pot, my own face reflected greedily in the glass as I watched in anticipation. Just the right ratio of water to beans (thanks, Mom) created the perfectly alluring aroma of thick, rich beans, with the sweet, soft hint of vanilla (it was Gevalia Vanilla coffee, highly suggested) in the beans. It filled up the whole kitchen and it was unbelievably intoxicating. When it had finally brewed I poured a mug and let the warm clay sit in my hands, watching the steam rise up from my perfectly crafted creation in transparent ribbons before taking the first sip. The bold taste was perfectly balanced with sweet vanilla of the beans — the first and last time I had coffee without cream, the taste was too perfectly balanced and rich to hide with flavored creamer. I swear I’ve never made coffee as perfectly as that first time. Since then, I’ve come into my own routine of how to make coffee the right way for me, the right amount of water to grinds, cream to use, sugar is it’s a strong blend, but nothing will ever compare to that first time. Cliche but true: you never forget your first. Can I Get an Easter Blend, One Jesus and Extra Holy Spirit? I am about to make everybody’s day better. It certainly was the highlight of my day when I found Abbey Roast, a coffee brewing business run by…wait for it…monks. Is that, or is that not, the coolest thing you HAVE EVER HEARD? Whether you agree or not, you have to give these monks a little credit. They offer nearly a dozen different types of roasts, with all their beans imported straight from Brazil, their holy blends only cost $12.50 AND all proceeds go toward expanding their monastery so they can give more money to charities knocking on their doors. Can you think of a better reason for buying coffee? Because I literally cannot. Delicious and soul-cleansing. Even if you’re not Christian, or religious at all, the cause for this coffee is as good as they come and it sounds absolutely wonderful taste-wise. Either way, this could be a perfect Easter present or just a generous (and delicious, for you) contribution to charity. And if you are religious or Christian, imagine them serving this at mass instead of wine. Seriously, people should petition for that. With our coffee, you animals, get your mind’s out of the gutter! When I visited Tony’s Coffee in Thomaston, CT, last week I tried their drink called Winter Spice. I didn’t do it because it was seasonal (it’s spring now), I was just fascinated by how the woman behind the counter described it: “a Dirty Chai”, she said. Count me in. Often Dirty Chai’s are made with spiced black tea and contain spices such as cinnamon, ginger, and cloves. Then a single shot of espresso and steamed milk is added. I will start off with a large: DELICIOUS. The mild, spicy taste was tantalizing and unlike any kind of coffee I have experienced before. Although it is out of season, I could imagine this being the perfect winter time drink; especially with the cinnamon, it tasted like a big liquefied ginger bread man and had that warm, spicy kick of holiday foods and drinks. That being said, the coffee was rather watery. I attributed it to the possible combination of tea and espresso. With their being only one shot of espresso, the thicker, coffee-consistency was overrun by the watery tea. The best way to describe it was rich flavor with not-very-rich consistency. Despite the drink being so thin, it was a new, flavorful experience that I would definitely suggest. I don’t even think it would hurt to ask for maybe one more shot of espresso or add some milk or coffee yourself just to fill out the drink a bit more. Keep this one in mind for the winter, or even for a rainy spring day or cold summer night, it’s the perfect drink to warm you right up! Who doesn’t like a good dose of caffeine? That’s what coffee’s for, right? There has been some discussion lately about caffeine pills coming up hot on coffee’s tail. For those of you who aren’t familiar with the pill, most of them contain somewhere around 200 milligrams of caffeine, are quick and easy to take, and do not stain your teeth yellow. Those aren’t my words, I swear to the coffee Gods. Some people would rather avoid a medley of things that come along with coffee drinking: yellowed teeth, dehydration, overuse of sugar and cream which can often be unhealthy, and spending excess money on coffee. Alright, caffeine pill-poppers, I’ll play along. I can definitely see the convenience of the pill. You are monitoring exactly how much caffeine you want in your body and you also don’t have to keep spending money on coffee throughout the day to get the 2, 3, 4 cups some people need to keep going. HOWEVER, I think these poppers are missing some big points here. First of all, I won’t deny the yellow teeth thing. I’ve said it before, it’s my one big issue with coffee. Nothing’s perfect. Secondly, dehydration? Yeah, FROM CAFFEINE. Sure, coffee dehydrates you…but, news flash, so does straight-up, concentrated caffeine. Third, I get the cream and sugar thing, too. But there are plenty of organic, natural options for both sugar and cream that are a million times better for you than crap like artificial sweeteners and even regular sugar. Also, ween yourself off of one. That’s what I did! I no longer take sugar in my coffee, only cream or skim, which cuts down my sugar and caloric intake by a ton. Fourth, the money…I might have to give you that one. When it’s $7 for a bottle of pills that lasts you a few weeks, whereas some people spend $7 a day buying the coffee they need to get through the day (though I think those people may be crazy). But I have one final counterpoint to contend with that excellent point of the cost of coffee vs. the cost of caffeine pills: coffee brings something more through the taste and often the experience of coffee. What do caffeine pills taste like? Fake energy and plastic? Yum. Coffee — albeit, well made coffee, — brings flavor to your day, flavor to your life, and as I’ve talked about before, it can bring people together. You can make rituals and dates and communities over coffee, you can utilize coffee has an experience instead of just that boost of energy you need. This is probably one of the biggest things about coffee that I, myself, have learned through my new-found relationship with the delicious beverage, and I hope people won’t stray from coffee for convenience’s sake only. The day that becomes acceptable is the day when the term “caffeine pill date” starts becoming a thing. That’s sound riveting, doesn’t it? You walk into a Dunkin Donuts. You stand in a line, order your usual, and the coffee is presented to you in .2 seconds, pre-brewed with a quick pump of flavored syrup. Is it good? Most of the time. Is it convenient? Hell yes. Is it personalized? Not so much. For some people, coffee is about a quick pick-me-up, keeping full, or enjoying a sugary coffee drink (Dunkacino shout out). And that is okay! The wonderful thing about coffee is that it can be a lot of different things for a lot of different people. But for some people, coffee is more than just a quick, cheap stop on your way to class or work. For some people the flavor, the richness, the taste of the coffee is key. For others, the atmosphere of the coffee house plays into that. And while there’s nothing wrong with a Dunkins date or doing your homework in the dark corner of a Starbucks, there is something special about the atmosphere of an independent coffee house. Independent coffee houses are often few and far between, which creates a strong sense of solidarity in them. Being an employee or a regular of that coffee house is something special; there is no other coffee house like that specific one, it is made unique by the people that visit it and the area it is located in. They’ve got a good point there. Not only are you supporting a jewel in your community that represents your area and bring people together, but it is economically-savvy to help support small businesses. Win, win? I think so, my friends. So the next time you walk into your local indie coffee shop, look around and appreciate the fact that you are helping a community of coffee lovers thrive. Then pat yourself on the back. You deserve it.